Ah yes, I couldn’t resist to do another book review. And best of all, you can get a free copy of this book yourself, more on that later. I’m a frequent visitor at MPUG’s site and really like the articles that are posted there. I’m even a contributor sometimes, and have been featured with 9 articles in the top 99 articles this year. Two other articles got my attention early this year, and I’ve finally found the time to read up on the book described in the articles. A tsnami happened but nobody noticed the wave yet. Now you might have thought Eric Uyttewael, that name rings a bell. That could be because I reviewed some of his books before. Writing down this list now, and reading the book, I had a strong idea of this being a great agenda for a 2 days training course! Just imagine a course focused on best practices that is highly adoptable to Microsoft Project. Hmm, maybe I’ll do that *take mental note*. But back on track, the best practices are documented in chapters mostly 10 to 20 pages long. And if that is still to long for you, page 3 and 4 contain each best practice boiled down to 5 to 10 lines of text. At a minimum, download the file, and read those two pages! If, however, you are a bit like me and actually read the whole book, you will find each chapter containing a rich description of the best practice. As well as a case study in most of the chapters. Eric Uyttewael already described his view of the document quite clearly, focusing mainly on the resources and a decent allocation of their time. I agree with his views and want to add my opinion to another part of the book. In other words, chapters 8, 9 and 10. I’ve previously written a book review on project management where I focused on the risk chapters as well. And although it isn’t the most interesting part of the project managers life, I believe it is a vital one. Especially when you are responsible for substantial amounts of company funds to bring the project to a good finish. Progress and Baseline, are two other chapters and concepts that are underutilized in most schedules. Which is a shame really, they make your life easier, and shouldn’t take up much time to process if you use the right tools and know how to use them. Microsoft Project isn’t mentioned in the book as THE tool to use, but most if not all of the best practices are relatively easily to achieve with it. 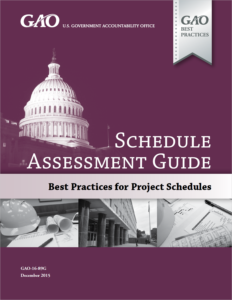 If you have read the GAO Schedule Assessment Guide and still want more best practices you can take a look at prequel of the book, this document is also a free download! And this one relates cost estimating and assessment of capital programs. Hmm ideal reading before bedtime! Book reviews are a major part of TPC, and I like the idea of guiding people to the best books that are out there for our little niche called Project Management. And things don’t get any better then this. A free book, easy to read and full of advice, a real gem! I hope you have enjoyed the review, and hope you consider downloading a copy of the GAO Schedule Assessment Guide.